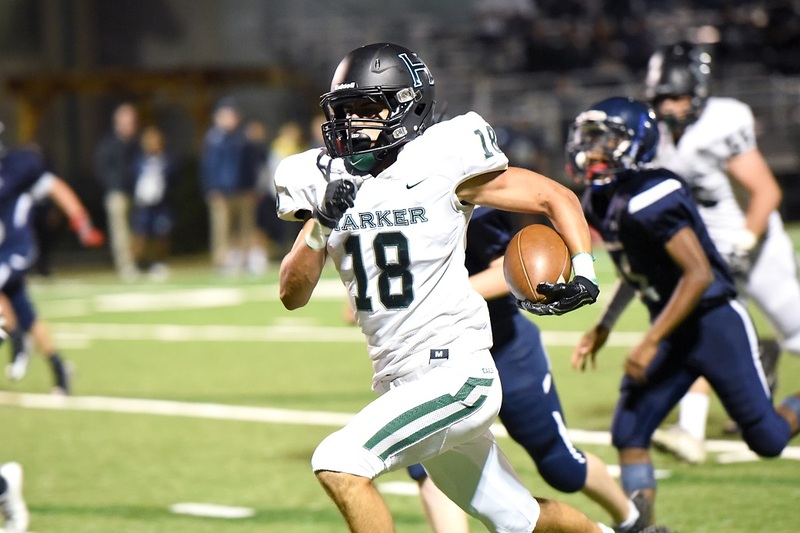 Nearly 1,000 community members visited the upper school tonight for the 2018 Homecoming celebration, where families, faculty and staff socialized, reminisced and cheered on their Harker Eagles. The evening started with the grand opening of the Harker Athletic Hall of Fame in the new athletic center. Inaugural Hall of Famers are Adam Vucurevich ’02, Jason Martin ’07 and Tanya Schmidt ’08, along with Phyllis Carley, known as “Mrs. Carley” (1920-2009), Harker’s first super fan, represented by her nephew Dale Johnson ’80. Watch for the full story and bios soon. Revelers began arriving at around 6 p.m. to partake of the food at Mrs. Carley’s Café and watch the teams warm up on Davis Field, while the Harker Pep Band took its place in the stands to provide the evening’s music. Attendees gathered in the bleachers just before kickoff to see the annual pregame traditions: a performance by the lower school’s junior cheer squad and the Eaglets Fly-By. Soon after, the Harker Eagles sprinted through the Gauntlet of Spirit to take the field for their game against the Lobos of Elsie Allen High School. Minutes prior to the start of the game, a brief memorial was held for former head of school Diana Nichols, to honor the tireless effort and depth of vision that was so crucial to making Harker what it is today. The Eagles scored 21 points in the first quarter and were up 35-0 by halftime, during which the crowd witnessed the exciting finale of this year’s tug-of-war contest, in which the seniors triumphed over the juniors. The upper school cheer squad and varsity dance team performed to an enthusiastic response from the crowd, just before Dr. Teja Patil recieved Harker’s 2018 Distinguished Alumni Award, followed by the crowning of this year’s Homecoming Monarchs, seniors Kelsey Wu and Neil Ramaswamy. The Eagles won with a final score of 56-0.